Organic juice powders contain high concentrations of valuable nutrients, including chlorophyll, vitamins, minerals and natural enzymes. These juice powders are 100% pure, CO2 cold temperature dried and contain no insoluble fibers, carriers or additives. This high purity makes them more soluble in water and ideal for use in a variety of drink mixes. 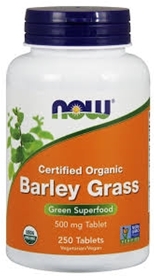 Barley grass is richer in individual vitamins and enzymes than many other known super-foods. The real benefit and power of Barley grass is the combination of all these nutrients and enzymes in one foodNutritionist, Gillian McKeith, states in her book, "Living Food for Health: 12 Natural Super-foods to Transform Your Health", that barley grass offers more protein than a steak, five times the iron of broccoli, seven times more vitamin C than orange juice and 11 times more calcium than milk. It has also shown to balance the pH of the body. Research done on patients with ulcerative colitis showed that those given Barley grass showed significant improvements in their symptoms - including fewer episodes of diarrhoea and less pain - compared to the group receiving conventional medication (standard anti-inflammatory medication including steroids). Ulcerative colitis is linked to low levels of friendly bacteria in the gut and an accumulation of toxins in the bowel, and barley grass helps reverse this by stimulating the growth of friendly bacteria, resulting in reduced inflammation and less symptoms. Barley grass helps combat ulcerative colitis by lowering the amount of inflammatory chemicals in the bowel. Suggested Usage: As a dietary supplement, take 10 tablets daily as desired. Consider taking this product in combination with NOW® Detox Support™ and Probiotic Defense™. Contains no: sugar, salt, starch, yeast, wheat, corn, soy, milk, egg, shellfish or preservatives. Vegetarian/Vegan Product.